Leading Manufacturer of valves manifold, two valve manifold, three valve manifold and five valve manifold from Vadodara. We are a main maker and importer of Valves Manifold. These items are fabricated utilizing predominant quality stainless steel. We likewise embrace customization of these items according to the obliged details of our customers. We additionally offer customization office for areolas, pipes and tops in different choices of stainless steel, cast steel, gentle steel and compound steel. Customers can benefit this extent from us at business sector heading costs. Backed by highly knowledgeable professionals, we have been able to offer superior quality Two Valve Manifold which is used with pressure gauges, transmitters, pressure switches, our offered two valve manifold is manufactured under the direction of team of experts using best grade of material. Along with that, our valuable patron can avail this valve manifold from us at nominal prices. We are renowned manufacturer and importer of excellent quality assortment of Three Valve Manifold that is widely appreciated for its long service life. 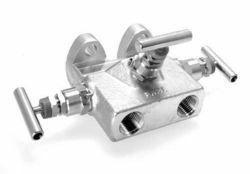 Used in conjunction with differential pressure transmitters, our offered valve manifold is broadly acclaimed in the market due to its excellent finish. Apart from this, our esteemed clients can avail this manifold from us at industry leading prices. By utilizing skills of our dexterous workforce, we are manufacturing and importing a comprehensive assortment of Five Valve Manifold which has been priced at very reasonable rates in the market and these valves are used for controlling the flow of the liquid and they are available in a range of sizes and designs. 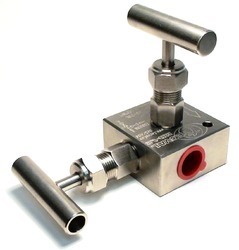 Used in combination with differential pressure transmitters, the offered valve manifold is provided in numerous specifications as per the details of customers.